Well, the day had arrived to take on the infamous Marmotte, probably the most well know Gran Fondo in the world, back to its classic route of Glandon – Telegraphe – Galibier – Alpe d’Huez. As discussed here, a ridiculously early start was required. After all too short a spell in bed, I found myself basically still asleep at 4.30am forcing down my breakfast; two bowls of porridge with peanut butter mixed in, and two boiled eggs (eating plain eggs at that time of day was grim, but necessary to get a good chunk of protein in the belly before a long day out). A cold and quite enchanting roll down the Alpe an hour later (descending in the dark, with only the sound of other rider’s freewheels spinning, at that time of the day is incredible), I was dropping off my descdending kit with the guys from Sports Tours International, the tour provider I was riding with. They had offered to pick up stuff from us so that we could descend in legs warmers and proper jackets etc – it was only about 9 degrees at that time of day. Having this available was a real godsend, as I would have been freezing for hours if I’d had to descend just in a packable jacket that I then had to carry all day. By 6.20 ish, I was in my pen, ready for the 7am depart. As I knew I’d be stuck in the pen for a while (we had to arrive at least half an hour early), I had prepared a peanut butter, Nutella and banana sarnie, a handful of chocolate coated coffee beans, and an extra bottle of water to keep me company. Waiting in pens is always a little nervy everyone eyeing up other riders, contemplating their potential abilities based purely on the bike, their kit, and the number of veins you could see in their legs. I win on the third but fail on the first two. Eventually, we were off, and inevitably, the pace was sky high, with pelotons forming up all over the place .it can be quite a hectic experience being knuckle to knuckle with riders you don’t know or trust, and this showed with a few spills in the first 10km or so, one of which I was narrowly able to avoid; a rider went down a hundred meters or so in front of me, and I was well out of his line, but his full bidons spilled from their cages and rolled ominously in my direction… I was glad to narrowly dodge these little vessels of carnage. Within about twenty minutes, we hit the base of the Glandon, and inevitably the bunch was split. The first 4km or so of this are unrelentingly steep, maybe 10% at least. I thrive on that kind of gradient so was able to work my way steadily through the pack, only to lose ground again on the couple of little descents and flatter pitches on this roller coaster mountain. It’s a truly beautiful climb though, taking you through pretty little villages and past streams and waterfalls before opening out at the top onto wide open plains and a reservoir. Fortunately, as I was in the top 10% or so of the field at this point, the feed station at the top was really quiet and so I could quickly refill my bottles and stuff some cake into my face before the descent. Coming down the Glandon is extremely technical and narrow, and fortunately it was neutralised. Racing down there would be unpleasant and really dangerous. Nonetheless, riders were still pushing hard on the descent, presumably to stay with fast riders to bunch up with in the valley below. We hit the valley at the bottom of the col – a 20km ish stretch along pretty unpleasant main roads through industrial towns – and I found myself in a decent paced bunch. Typically, there were only 5-6 riders working to take the wind, one of whom was me. The short glances I’d taken over my shoulder led me to believe that the peloton was around 20 riders or so, and so was reasonably happy to work… much to my annoyance that it turned out to be well over a hundred. I pulled up for a roadside ‘call of nature’ just before the base of the telegraphe, and I was totally amazed at the size of the stream of riders that flew past. It really pissed me off that a featherweight like myself spent a good chunk of time and energy keeping up the pace when big powerful rouleurs just sat in. Ah well, such is life, and such is the way of all gran fondos. Who needs beautiful views when i can stare at my stem all day? The telegraphe is the climb that everyone forgets about on la Marmote, a sort of appetizer for the immediately following Galibier. It was taken by all at quite a strong pace, and being very steady in pitch and kind of gradient, at maybe around 7% average, it really does trap you in to pushing probably a bit too much given what you’ve still got left to take on. I’m pretty sure I did this, and would pay for it later. The thing about Telegraphe – a chunky climb in itself – is that it really is just the intro to the massive Galibier. Once over the top of the climb, it’s a rapid and brief descent, a quick amble through Valloire, and suddenly you’re into the long valley drag that forms the first half of the 17km beast. This Galibier is essentially a climb of two halves; a shallower valley drag, then an unrelenting barrage of hairpins and steep ramps. The valley drag was relatively straightforward, at only around 5% average. I found this a little torturous; you can see the main face of the Galibier all the way along the valley, and I knew that around 2/3 of the way into the climb, you hit a sharp right hand bend and BOOM you’re into the climb proper; around 7km at about 10% gradient. Having the Telegraphe and first of Galibier in the legs over this punihing climax to the col made it really half hour or so. Furthermore, there wasan at times cold, and pretty strong headwind all the way across the exposed and barren mountain face. As I got to the top 2km or so of the climb, I found a dutch guy sitting on my wheel, letting me take the wind the whole time. This started to really piss me off as he showed no indication of taking a turn as the windbreaker. I did all the tactics used by the pros to shake him off, like moving to the side of the road where he would run out of space in which to find shelter and (trying to) surge at random points, but the fucker was like a limpet. Wherever I went, he was able to just stay to the side of me out of the wind. I don’t mind giving riders a wheel to follow but he was just taking the piss. I eventually expressed my displeasure at the chap in my finest French (metaphorically speaking) before the limpet dropped me and sailed off. Again, such is life. Although it annoyed me quite significantly, trying to rid myself on my unwanted companion, and spying Antony – a Haute Route buddy – a few hundred meters up the col spurred me on. Ant is a strong rider and must have been having a bit of a tough one on the Galibier; I was slowly gaining on him and he was a great carrot to chase. I didn’t quite get him before the summit, but he had certainly served his purpose. Sports Tours had set up their own feedstation at the summit of the climb to allow riders a quicker turnaround; feedstations at these events, if you’re unlucky, can be a bit of an elbows out scrum of riders barging through the masses to shovel much needed goods into their face. I was the first Sports Tours rider to the feedstation and I think I caught the guys off guard; they looked like they were having a lovely time sunning themselves on the peak and admiring the views. Anyway, a few hundred meters from the station I shouted out at the guys and they woke from their reverie and started getting ready for me. They provided me a great service, filling my bottles whilst I grabbed some bits from the bags that we had left with them the night before (this was another great service of theirs – you could put some provisions in the bags to collect at the Galibier to prevent you having humungous pockets all day) and shovelling a handful of nuts and salty crackers down my gob. Savoury food at feedstations wind every time. What followed was a good 30km or so of rapid descent off the Galbier and down the Lautaret. The Lautaret is described as a col, but it’s more just a massive long drag of around 4%. Although there was a fierce headwind all the way down, I spied a bunch forming a few hundred meters in front and made a massive push to get onto their wheels – coming down the Lautaret solo would be incredibly foolish. Working down the drag in a small but efficient group really allows a great pace to be held whilst ensuring the matches are kept preserved for the horror of the Alpe that awaits. I’d heard a lot of fuss about the dangers of the tunnels on the Lautaret, some of which are extremely dark and badly surfaced. The Marmotte organisers had issued little LED lights such was their worry about this. To be honest, they weren’t as bad as I expected; although you certainly needed to get your sunglasses out of your line of sight to be able to see safely enough, riding carefully and leaving a bit of a gap between wheels seemed sufficient. Well, after the pretty pacey descent off the Lautaret in my bunch of 20 or so, we meandered down to the valley at the base of the Alpe d’Huez and a notable change came over the group… the speed dropped, with the previous sense of urgency to push the pace vanishing. There was a real sense of fear coming over the group, with the Alpe looming ominously over us on the left. I’d never ridden the full Alpe at this point, and having been driven up it on the way to the hotel, wasn’t really relishing the prospect after 6 hard hours in the saddle. The opening curves arrived all too soon and it really is a bludgeon to the face. The first 4 bends or so are about 10% average, with no let up. The legs felt reasonable in the first few hairpins, but I think this punishing entry to the climb was the nail in my coffin for the day. The hours and hours in the saddle, and the hard pushes earlier bit into the legs and suddenly the power went. I didn’t have one of those ‘fall of your bike and cry’ type bonks that can happen, but the energy just vanished and the legs turned to lead. I find this happens to me quite frequently if I’m out for over around 6 hours… no matter what you eat and drink on the bike, I think it’s the fact that you start missing meal times and the valuable calories they provide that hammers home. The rest of the Alpe was a real fight for survival. By this point, I’d not been passed on a climb. Whilst I was still crawling past some similarly devastated looking riders, including one who I saw being sick over the barriers, I was starting to be dropped. All I could do was just break the climb down… I estimated how long it would take me, and tried to ignore the numbers on the bends indicating how many remained… some of these seemed to take eternity to arrive, and I found that looking out for them made the time pass all the slower. I knew that at bend 7 there would be a Sports Tours mini feed station where they would pass up a drink or a gel, and true to form, Ed was there, shouting if I wanted anything. I knew by now I only had 20 minutes or so left, sick with energy products and beyond salvation, and barely able to take my hands off the bars which I was gripping onto as if my life depended on it I managed to shout that I was beyond help and carried on…. And eventually it was bend one… five minutes to go max… and almost poetically, the heavens opened; the storm that had been threatening for the last half hour erupted and monsoon rain engulfed the road. This felt like some sort of metaphor of biblical cleansing, and knowing I’d soon be home and dry in the food tent, I actually sort of liked it. I heard tales of the back of the field still cresting Galibier when the rain started, and the casualties were numerous – not spills and crashes thankfully, but the inevitable occurrence of hypothermic riders being wrapped in foil, semi comatose, 2600m into the sky. Suddenly, before I knew it, I was collapsed into the food tent with an array of pasta, tabbouleh, carrot salad, and cheese in front of me. I squeezed down as much as my tormented stomach could manage, by which point the rain abated. I then miserably clicked back into the pedals and square pedalled my way the 500 painful meters back to my hotel. Although I’ve done rides of nearly the same distance and elevation gain, this really felt a step up. 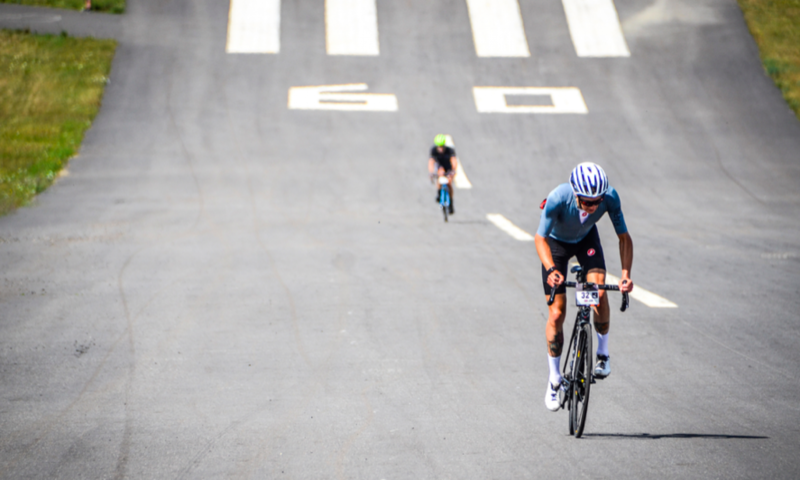 The general level of competition was high, making you work beyond yourself, and there’s just something about having a climb as unpleasant as the Alpe to get over to reach home that is bordering on the barbaric. I thought that the Plateau de Beille summit finish of Ariegeoise was tough, but it felt nothing compared to this. Would I do it again? Maybe not, but purely because there’s other events I’d rather try instead, namely the Maratona. Would I recommend it to others? Yes. Once you’ve ridden the Marmotte you can truly say you’ve done an ‘epic’ ride. I’d also highly recommend the support of Sports Tours International, who make the weekend slightly less stressful and provide perks that really do make the day a little more comfortable. If that’s actually possible. Long blog. Sorry. Massive ride = massive write up. Great story – thanks for sharing. Could you share details on your bike and gearing? Hey Claus, glad you enjoyed it! Are you riding Marmotte this year? I’m going back for a second bash at it too. I would have been riding with a 34-28 as my smallest gear, i.e., a compact chainset and 11-28 cassette. That was enough, but there were certainly times when i’d have appreciated a 30 on the back!